When the Amiens offensive launched by the Fourth Army astride the Somme on 8 August 1918 ran out of steam, the Third Army took over the main advance. What followed in the last days of August became known as the Battle of Albert. In fact, Albert was taken by III Corps from the Fourth Army, which secured the right flank of the Third. For New Zealanders, though, the last part of August has always been the period of the Battle of Bapaume. The town was the Third Army’s main goal. Advancing in the centre of the Third Army was IV Corps. As the New Zealand Division formed the centre of IV Corps, it was at the heart of the Third Army and, therefore, at the heart of the Battle of Bapaume. The battle was significant for the New Zealanders in several ways. During its course, they received air-dropped supplies and were counterattacked by tanks for the first time. Three of them won VCs, the most for any battle in the nation’s history. Involving failed and successful attacks in equal measure, it was their toughest action of 1918 and resulted in 3000 casualties, including 821 dead. Many of these were from the large pool of reinforcements that replaced the losses incurred during the defensive fighting. The veterans started to show the war-weariness that was gripping the Australian divisions. Not for nothing do New Zealanders call the battle `Bloody Bapaume’. As most of the German reserves were facing the Fourth Army in front of Amiens, striking towards Bapaume, 40 kilometres northeast, promised to catch the Germans off balance. The Third Army might then outflank the Germans opposite the Fourth. Field Marshal Haig wanted Bapaume seized rapidly. 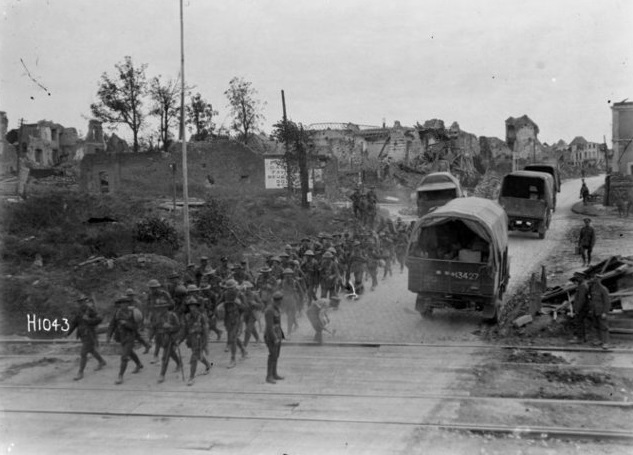 Between 21 and 23 August the Fourth Army took Albert and the Third reached the Arras-Albert railway, bringing Bapaume within striking distance. Running from Loupart Wood through Grévillers to Biefvillers-les-Bapaume, the last ridge to the west of the town had to fall first. Grévillers and the wood were well defended and the 5th Division, on the left of the New Zealand Division, could not capture them on 23 August. The task passed to the New Zealanders, whose role so far had been limited to gaining the line of the Ancre north of Miraumont. On 24 August the 1st New Zealand Brigade was to advance 450 metres past both Grévillers and Loupart Wood, after which the 2nd Brigade would take Bapaume. The 37th Division on the left would capture Biefvillers. Following up the German withdrawal to the Hindenburg Line early in 1917, the Australians had passed through this area. 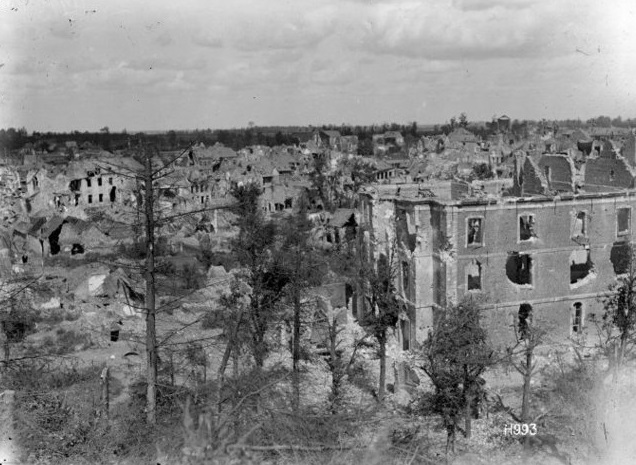 When the Germans returned in the Michael offensive in March 1918, they fortified the ruins of the villages they had devastated during their earlier retirement. From the New Zealanders’ point of view, the ground offered good going to tanks as it lay just beyond the 1916 Somme battlefield and was not cut up by shelling. Thirteen heavy tanks and some Whippets supported them. But the uncertainty as to the situation on the evening of 23 August resulted in rushed planning that left no time to organise an artillery barrage. The attack would be a `silent’ one, which initially helped the New Zealanders when they stepped off at 4.15 am next morning. With the darkness and rain blinding the Germans, the absence of a barrage removed their last hope of detecting the assault until it was almost upon them. The Germans still defended strongly. 1st Wellington took until 12.30 pm to clear Loupart Wood. On their left, 2nd Auckland had enveloped Grévillers by 9 am but could not get beyond it. Engineer Sergeant Sam Forsyth led an assault that took a strongpoint holding up part of the attack. Killed afterwards, he was awarded a posthumous VC. Further left, 2nd Otago and 2nd Canterbury from the 2nd Brigade, and 2nd Wellington from the 1st Brigade, cleared Biefvillers by mid-morning, thereby securing the 1st Brigade’s left flank. The 37th Division, which should have taken the village, had fallen behind. Heading towards the D929, the Albert-Bapaume road, part of 2nd Otago was stopped just beyond Grévillers. The rest continued with 2nd Canterbury towards Bapaume, 1.5 kilometres away on the far side of the D929. Avesnes- les-Bapaume, then a hamlet west of the town, now an outlying suburb, was taken but could not be held. Since the start of the Third Army’s offensive four days earlier, nine German divisions had reinforced the eight originally opposing it. The Germans ahead of the Third Army thus regained their balance and, as the tough fighting on 24 August showed, were putting up the same stiff resistance that had slowed down the Fourth Army. It was particularly strong in front of Bapaume, which did not bode well for the New Zealanders. In the continuation of the advance on 25 August, in which IV Corps was to reach the line Riencourt-Beugnatre three kilometres beyond Bapaume, they had to envelop the town, thereby forcing the Germans to abandon it. Costly street fighting through its ruins would then be avoided. At 5 am on the 25th, 1st Auckland and 2nd Wellington from the 1st Brigade headed for the southern side of Bapaume. Hit by heavy fire, they stalled on the D929. Supported by a creeping barrage and 23 tanks, whereas the 1st Brigade had neither, the 2nd Brigade made for the northern side of Bapaume. 1st Canterbury on the right briefly took Avesnes and reached the D917, the Arras road. 1st Otago on the left was halted on the D917. But both battalions got across the road in capturing Monument Wood and part of Favreuil, 1.5 kilometres north of Bapaume, in a second attack at 6.30 pm. Nonetheless, the town’s well-sited and concealed defences had withstood the New Zealanders a second time. As one of them remarked, it was turning out to be `one of the toughest nuts to crack’. The First Army joined the offensive on the left of the Third on 26 August but it made no difference to the New Zealand Division, which was to advance a third time against Bapaume. South of the town, the 1st Brigade barely progressed beyond the previous day’s line. The only bright spot was the knocking out of three machine-guns by Sergeant Reg Judson of 1st Auckland. He won the VC. North of Bapaume, the Rifle Brigade, which had relieved the 2nd Brigade, reached the D956, the Bapaume-Beugnatre road, a gain of just 450 metres. Pinpointing the cause of the grinding pace of the advance, a New Zealand artillery observer expressed sentiments that the Australians would have echoed: `We share great admiration for the way the machine-gunners of the enemy stick to their work. Most died at their post’. Another attack that evening achieved little but at least the Rifle Brigade was now firmly ensconced east of Bapaume, threatening the Germans with envelopment. A continuous bombardment commenced to give them every incentive to withdraw. But on 27 August they belted two attacks by the 63rd Division on Ligny-Thilloy, on the right of the New Zealanders, who stood fast that day and the next. The New Zealanders’ patrols still attracted intense German machine-gun fire. An attack on Bapaume was being planned when the fire petered out early on 29 August. Cautiously entering after dawn, New Zealand patrols found the Germans had gone and the town `nothing but a few acres of bricks’, according to Private Stayte of 1st Auckland. It was booby-trapped just as extensively as it had been when the Australians entered in 1917. 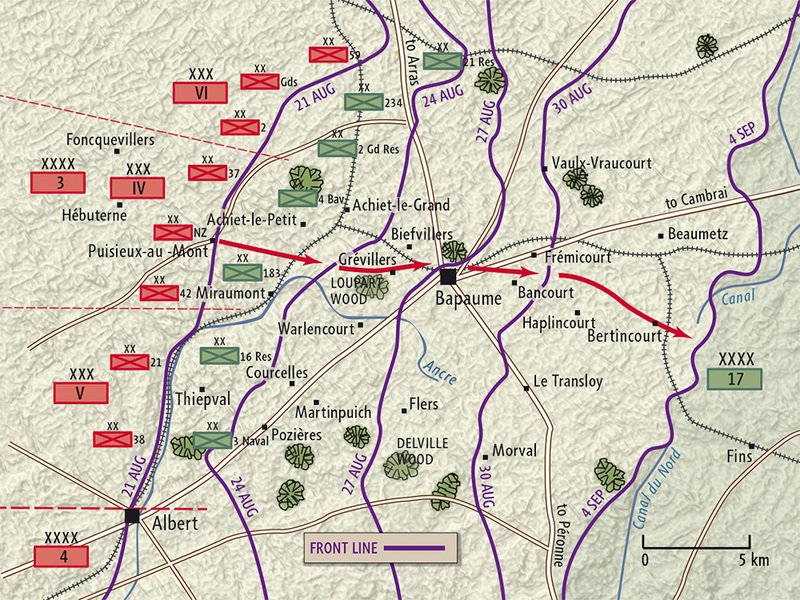 During the day, the Rifle Brigade established a new line 1.4 kilometres beyond Bapaume and Beugnatre. At last able to move around the southern side of the town, the 1st Brigade took the heavily defended sugar factory on the Cambrai road to the right of the Rifles. Both brigades started the 2.2-kilometre advance to the ridge behind the villages of Bancourt and Frémicourt at 5 am on 30 August. They reached the crest but could not hold it. A German counterattack with tanks next morning was driven off. Forming the centre of a wider attack on 1 September, the two brigades took all but the Bancourt part of the ridge. Sergeant John Grant was awarded the VC for clearing machine-guns that held up 1st Wellingtons. Relieving the 1st Brigade and the Rifles that night, the 2nd Brigade secured the uncaptured section of the ridge on 2 September. `Bloody Bapaume’ was over. Throughout the battle, the New Zealand Division had fought with one, and sometimes two, open flanks because it consistently outpaced the divisions of IV Corps on either side. Major-General Russell, the divisional commander, seemed out of touch, probably because he was tired and quite ill. Partly for this reason, orders often arrived at the last minute. Like the Australians, the New Zealanders had the skill and experience to know what to do anyway. Their effort at Bapaume deserves more recognition but, ironically, some of the blame for its obscurity rests with them. The New Zealand press misrepresented Bapaume as a pushover that cost few casualties. So no-one gave it a second thought, especially since it coincided with the stunning Australian capture of Mont St Quentin, which stole the limelight from everything else.